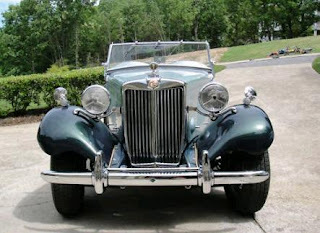 Just A Car Geek: 1953 V8 MG TD! For a person who claims to not like engine swaps, I sure have been featuring quite a few lately, haven't I? This is a 1953 MG TD with a Ford 289 V8 in it. The conversion was done in 1963. 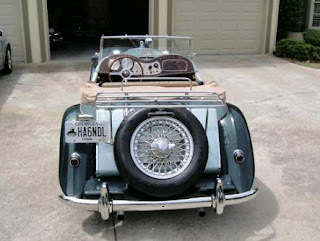 Besides the V8 this car received a Ford 4 speed top-loader transmission and a Triumph TR-3 rear end. 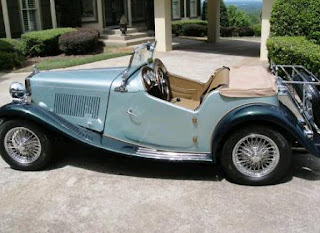 The seller says that from 1963 until early 1980's it spent most of it's time as a race car, mostly in the Northeast. 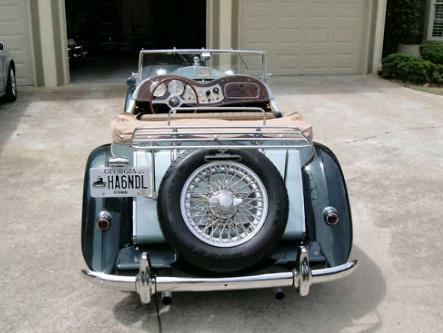 He has no records to prove that but, with a car like this, who cares? It's history isn't all that important. 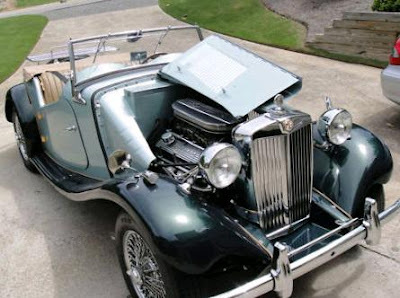 The seller says that the firewall was moved back and the frame was strengthened to accommodate the engine. During its recent restoration it received an MGB front suspension with disc brakes. The rear brakes remain Triumph finned drums. This V8 conversion looks like it was very well done. Still, I'd bet it's a handful to drive. What really impresses me is that this car doesn't look like a hotrod. It just looks like a nicely restored MG TD. As the seller writes, "If you park it with other MGTD's people would not know that is was not stock, but once you start the engine, everyone looks in disbelief!" I bet they do! Located in Marietta, GA, click here to see the eBay listing. What a wonderful TD, I have only seen one other with a Ford V8 swap, the other was running an early (1937) Ford flat-head V8/60. If anyone knows the whereabouts of the car featured here please drop me a line: speaktoscott@gmail.com Thanks for this post. Cheers.